The Glengarry Bonnet or just Glengarry, is a traditional boat-shaped hat without a peak made of thick-milled woollen material with a toorie on top, a rosette cockade on the left, and ribbons hanging down behind. It is normally worn as part of Scottish military or civilian Highland dress, formal or informal, as an alternative to the Balmoral bonnet, or its less formal variant, the tam o’ shanter. 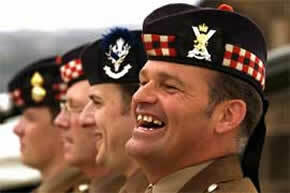 Among Scottish regiments, the Glengarry is by far the more popular uniform headdress. The Glengarry was made part of the uniform of the Glengarry Fencibles when they were formed in 1794 by Alexander Ranaldson MacDonell of Glengarry, of Clan MacDonnell of Glengarry, who has been said to invented the cap, though it may have originated earlier when Balmoral bonnets were bent and creased.